MEAT! Meat on a bun... Right, the call of ground meat. A "burger call", to be exact. The need to sink your teeth into meat, cheese, onions, bacon and other compliments all encased within soft buns (sometimes lettuce) has come a long way from the days of fast food joints. Hey, I'm not dissing the likes of McD's, BK, Harvey's and the sort. In fact, probably my favourite burger comes from the land of In-N-Out. However, the burger is no longer only relegated to a drive-thru. It almost seems like we can get gourmet anything these days, so why not the burger? Premium "fast-food" type places have popped up such as Fatburger, Vera's and 5 Guys. Yes, the burgers are fancier; but they come with a premium price tag as well. One can easily part with $15.00 at the aforementioned burger joints. If we are going to toss that kinda coin, places like Burger Heaven, Splitz and Moderne creep into the discussion. Strangely enough, one of my favourite burger joints is the cheapest as well - Burger Burger. 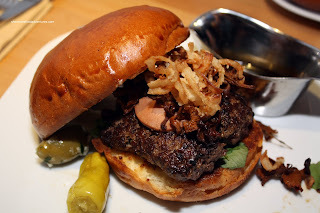 I gotta admit that some of the chain restaurants do good burgers as well, in particular, The Burger from Cactus Club. 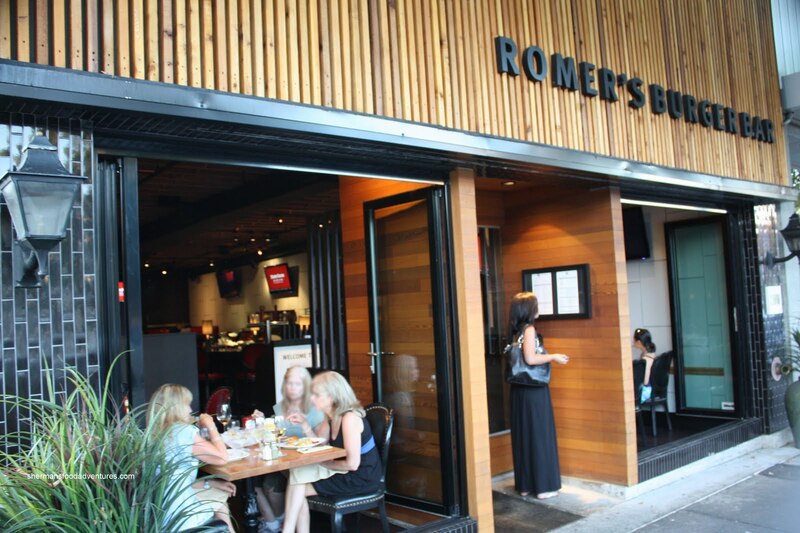 Romer's Burger Bar, situated in the former location of Pinky's, is the new kid on the block. There has been a buzz about their burgers and I really needed to see for myself. Taking advantage of the softball team once again, I suggested we give it a go tonight. For once, we could go to a place all stinky and sweaty without looking too out of place. Once we settled in, I noticed that the interior looks pretty much the same as it did before. However, we go from steaks to ground meat. With that in mind, they do have a burger that resides in steak pricing territory. Would I have anything other than The Ultimate Kobe Classic? Complete with foie gras pate, chantrelles, fried onion strings, truffled mayo and a side of demi-glace, this is no ordinary burger. For $24.00, it'd better be special. Served on a brioche bun, I thought the burger was pretty good. However, once I began to use the demi-glace, that kicked up the flavour quotient exponentially. With that being said, the demi-glace would've made most burgers taste damn good. It is worth noting that using too much overwhelms everything else and that's all I tasted. Due to the limitations imposed up here in Canada, we can't get rare burgers. 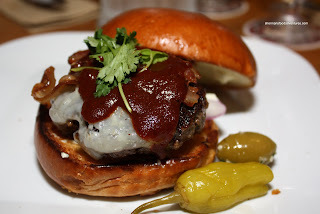 It's too bad because a burger can only be so juicy when it's practicall y well done. Fortunately, the high fat content of the meat allowed my burger to be very moist despite being cooked all the way through. 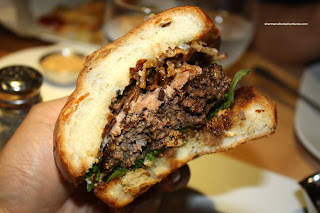 The exterior of the patty had nice crispy dark portions that both afforded flavour and texture. I'm a big fan of brioche, so the soft bun really worked for me. I'm not going as far as saying this is the best burger in town; but it definitely is a good one for sure. 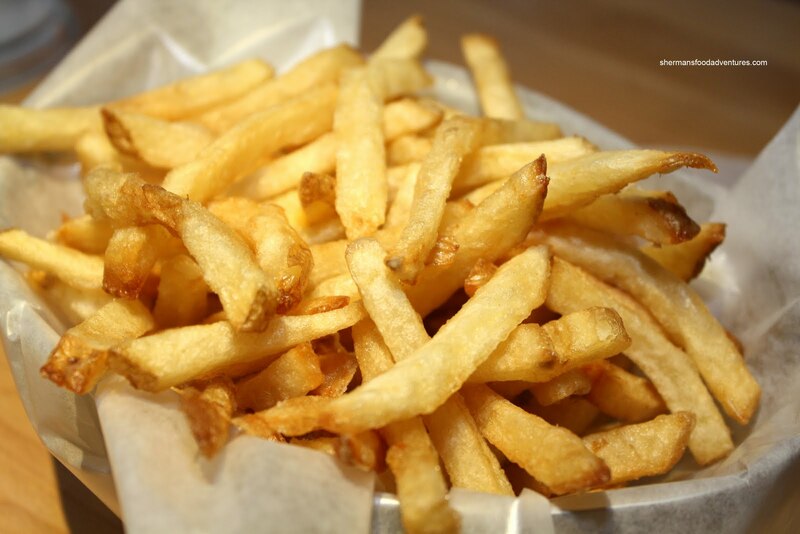 Fries are not included with any of their burgers; but the regular sea salt fries are only $3.00 and enough to share (so no big deal). 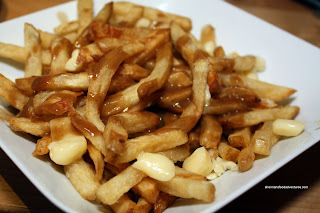 I really wanted to try the Poutine and fortunately for me, Bear was up for that. The fries were good; but less crispy than we expected from double-fried fries. One complaint was the taste of "new oil". Where are the ashes of Al Bundy's grandmother? The gravy was a bit of a disappointment. We were very happy it was "real" gravy (this is substantiated by Bear since he has allergies to artificial colouring, corn starch, maltodextrin, you name it...), but it was weaker than it looked. Maybe there wasn't enough of it? Strangely enough, I tried some from Milhouse's order of Sea Salt Fries and they were crispier and hotter. Bear ended up with the Man's Man Burger which had thick sliced applewood bacon, amber ale cheddar, onion strings and smoked alder salts. Interestingly, there were tomatoes in his burger although the menu never stated as such. On the flip-side, Milhouse didn't get any tomatoes even though the burger description stated otherwise... He liked how the bacon was nice and crispy as he requested; but the slices were the smallest he'd ever seen - Kit Kats are longer (so much for the thick cut bacon). He did like the brioche bun, although the bun ratio was a bit on the high side. He wish he had ordered the Romer's Righteous Rib Burger - it looked awesome! Thus, Judes was awesome for picking it. 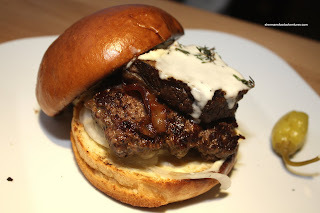 It had applewood bacon, sweet onions and gorgonzola sauce atop a large piece of braised short rib. She was surprised how much she liked the bacon (not a big bacon fan). The rib was moist and juicy while the bun stayed intact. Although the mayo was a nice compliment to the burger, it would've been nice if it was more evenly spread. Milhouse had the Rodeo Star which was a all-natural beef burger with starbuck spice, applewood bacon, red onions, tomatoes? (menu said it did, but none present), horseradish jack and smoky BBQ sauce. He thought the meat was moist and flavours were nice from the toppings. The flavour of the bun complimented everything. The sea salt fries were crispy. Not sure if he was really hungry so everything tasted extra nice. Portion size was good. Although being really hungry and a pig, he wouldn't have minded if there was more; but there was definitely enough. The toppings were perfect in terms of amount so they didn't squirt out the back like some places when you take a bite. For finger food, it was a clean eat. 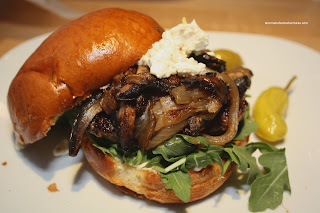 Boss Woman had the Magic Mushroom (not what you think) which consisted of chopped Portobellos, Boursin cheese and caramelized onions. She thought it was a satisfying burger, nothing incredibly special; but definitely worth the price. She also thought the fries were not as crispy as they looked. 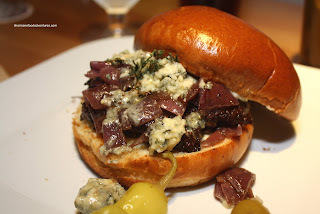 Finally, Inspector Gadget tried the Port and Stilton Burger. This flavourful burger consisted of port braised onions, fresh thyme and creamy stilton. He seemed to enjoy his burger; but remarked that it was not as juicy as he would've hoped. 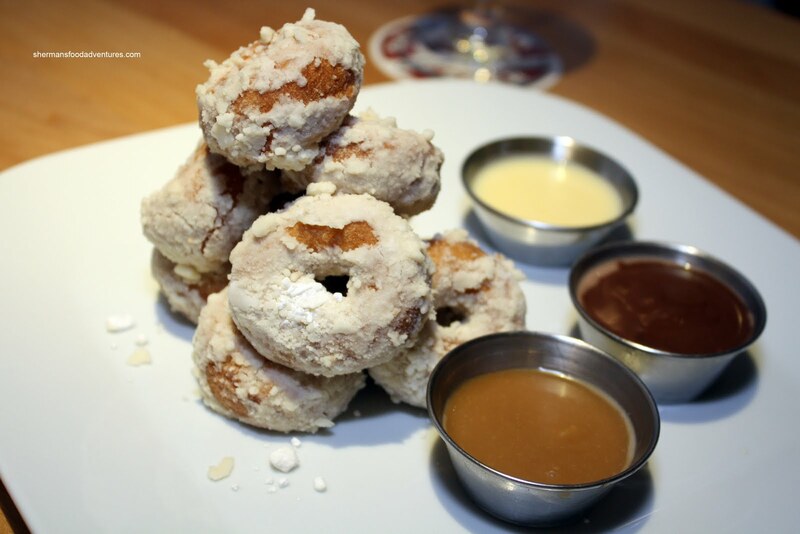 But seriously, the most unexpected part of the meal was the wicked Drunken Donuts. These devilish treats were dressed in an obscene amount of powdered sugar and served with 3 dipping sauces - Kahlua Nutella, Lemoncello and Maple Whiskey. Except for Silent Bob, most of us didn't care for the maple whiskey. But we all loved the kahlua nutella (nutty, chocolaty and smooth) and the lemoncello (great compliment with the tartness). You know what? 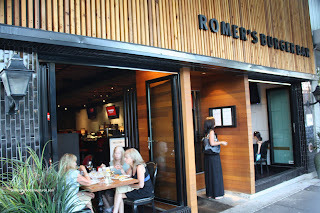 Romer's is decent, if not, dare we say good. Of course there are other great burger joints as well; but we mostly agreed that it is in the upper middle tier. Considering the location and decor, the prices are reasonable for what you get. Well, have you seen the $65 hot dog from Serendipity in NYC? They are fancying everything! What's next? The $100 taco? I think the one at db Moderne is better solely on the fact there is "more" for the price. 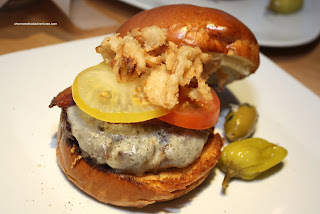 But in terms of being an actual burger, the one at Romer's is better. But the short rib one is probably the best of the bunch. Jeanie, thanks for the tip! I've been meaning to go back to try the shortrib poutine too! I happened to order Crave's burger very recently (been to Crave several times but never ordered the burger before). Wow was I pleasantly surprised ! And for like $11 it was a steal (topped with bacon). Next stop ..... Romer's ! Had the Righteous Rib Burger. The patty was a little too well done for my taste. Not sure if all patties here are cooked that much or if it was just my burger. Was looking forward to the Drunken Doughnuts. Dipping sauces were awesome, but the doughnuts retained way too much oil from their second frying. If I ever go back, I'll have to order the Kobe to compare with this rib burger. Oil, I believe most of their patties are cooked through. That's what I noticed with ours. The saving grace in our experience was that the burgers had a good amount of condiments to make up for that. With that being said, my Kobe burger was moist despite being cooked all the way through. But then again, it was $28. I'm not that impressed by Crave's burger, but the short rib poutine is mind-bogglingly awesome.